The Drinking Market have a physical location now! It’s been a long Long LONG LONG time since i’ve updated the space. Yes i know! Now, that’s because we’ve been really busy setting-up the first every Brick & Motar shop by The Drinking Market! A Thai Kitchen + Bar concept, we have finally launched our very first neighbourhood Thai Kitchen + Bar at the charming area of Katong. Placing the emphasis as a neighbourhood Thai Kitchen + Bar, we made sure prices are set affordable and wallet-friendly! Yes, all our items in the food menu are $10 or below and our prices are ALL nett! With no Service Charge or GST, we aim to be one of the most wallet and people friendly location for all to be in! Introducing you to our whole list of Authentic Thai Food prepared by our Thai Chefs who have been working in Singapore for the past 20 years and counting! You can’t get more Thai then this mates! See you here real soon! Traveling on Emirates should be about a Total Experience. Like a “jigsaw puzzle”, from the moment the chauffeur pick you up from your hotel, to the checking-in process, right up to boarding the plane and enjoying the in-flight entertainment, everything revolves around our Clients’ Experience and every part of the “jigsaw puzzle” should be complete – Mr Robin Padgett, Senior Vice President, Aircraft Catering, Emirates. Qn: How does having a whole range of reputable wines benefit a consumer? Is there a wine pairing option on-board the plane? Ans: In Emirates, we always believe in giving our clients an experience just like a night out in a fine-dining restaurant. Balancing our wine list, we carry wines from both New and the Old World, focusing on both quality and balance. In fact, we normally buy our wines 8-9 years prior to serving them, this does not only ensures that we have the sufficient quantity, but it also ensures that there is a proper storage facility and minimal movements to the wines when we keep it at our private cellar. Back to the question, Emirates does something a little more interesting, for instance, a trip to Europe, we will feature a more popular wine from the particular country or region, such as a 1996 Chateau Montrose for a flight to Europe! Our clients would not only be able to experience a whole list of well thought through wines, but also some interesting vintages from the wineries in the country they are visiting. Having said that, we do not have a fixed wine-pairing menu on-board the plane, however, our team of air crews have been through strict trainings on wines and spirits, and should be able to do a simple pairing with the meals provided. On top of that, we also recommend our clients to have fun with the pairings, a seafood dish does not necessary have to go with a white wine, try a pinot noir (red) from Burgundy, it’ll definitely go well as well! Qn: Can the consumers be expecting reputable wines from back vintages? Ans: Definitely! As mentioned earlier, we often purchase our wines at least 8 to 10 years prior serving them, and we usually store it at our private cellar in Bordeaux or Dubai, a good example is the 2000 Cos d’Estournel that we are currently serving, it was bought 6 to 9 years ago. Well, since you’re based in Singapore, let me share with you an example of what we serve on-board Emirates on your flight home. Ans: This is definitely one of the best questions, and i am glad you asked that. In Emirates, we take very close attentions to the quality our wines, in fact, we have a strong supply chain system from Dubai which transports the wines on-board the plane through a temperature controlled cargo, which our crews ensures minimal movements to the wines, so as to provide our clients with the best and the most optimal wine experience. Qn: What triggered the move to go into fine wines on board a plane? Qn: How does a palate differs at 40,000 feet in the sky compared to tasting a wine on the ground? Do the in-house wine team fly to taste? Ans: There are many school of thoughts about one’s palate that will be affected on-board the plane, however, we do not see that as the main issue, in fact, all our wines are chosen on-premise. Nevertheless, our panel, that includes the President of Emirates travels alot, thus, if any one of us were to spot a wine that does not taste necessary well or doesn’t justify the wines’ potential at 40,000 feet, we will definitely have it replaced. Having said that, it is uncommon and extraordinary to have a wine that “does not fly”, therefore, we’re glad that the wines we choose have been well-received so far! Qn: What can consumers expect to get in the future? Ans: I hope that our clients would happy with the service and in-flight entertainment we have on-board Emirates. In the near future, our passengers would definitely be able to enjoy and experience more interesting wines and back vintages from both renown and artisanal wineries. The World is our playground, we will consistently find the best wines to list on board the plane. Qn: Anything else that you wish to tell our readers? Ans: Yes! I would like to encourage our passengers to go through our wine list, and flip through it, there are definitely more interesting wines and spirirts that is worth a try. Do not just stick to the common ones that you have heard or seen, try something different, whatever you taste on-board, would definitely taste just as well on land. Platters Bistro & Wine Bar celebrates Halloween with late-night supper and drinks revelry! Drawing inspiration from the olden days in France, when champagne was labelled as “the devil’s wine” (le vin du diable) for its popping corks during the time it was first discovered, Platters Bistro & Wine Bar has rolled out a Halloween promotion that will make you merry this October! Together with its neighbour, Bartini, Platters Bistro & Bar is launching the 2-for-1 Devil’s Drink Promotion, comprising mainly of a selection of Champagne, Cremant and special cocktails for the night. Guests will enjoy 1 free Champagne/Cremant with every 2 drinks purchased at Platters Bistro & Bar or 1 free Champagne, Cremant or special cocktail (based on a limited selection) at Bartini with every 2 purchased. The promotion is only valid on 31st October from 10pm to 2am at both locations. To get into the Halloween theme, Platters has launched its supper menu, a selection of ‘ghoulish’ snacks to fill the hunger while you indulge in the night. Look forward to a selection of comforting bar bites such as Skeletor’s Fingers (Crispy Fish Fingers with Special Thai Sauce and Mixed Greens), Frankenstein (French Fries with Nori Mix), The Ripper’s Feast (Succulent Chicken Wings à la “Buffalo” served with Celery Sticks and Creamy Ranch Dip), The Corpse Bride (Gruyere Cheese Crepe filled with Asparagus, Jamon Serrano, and Mushroom Ragout), and Jackie-Os (Almond-Crusted Pumpkin Fritters on the Bed of Spinach, Feta and Dried Cranberry Salad). The supper menu items will only be available in half board size and prices will range from $19++ for choice of any three bar bites to $29++ for choice of any five bar bites on a board. Bar bites selection also include the popular House Platters such as the Charcuterie and Cheese boards. These will be available for order until 1am on 31st Oct.
For this night, Platters Bistro & Wine Bar is also open from 12- 3pm & 5pm to 2am. Bored of having just a bottle of wine with your whole meal? You’re in for a change this time! 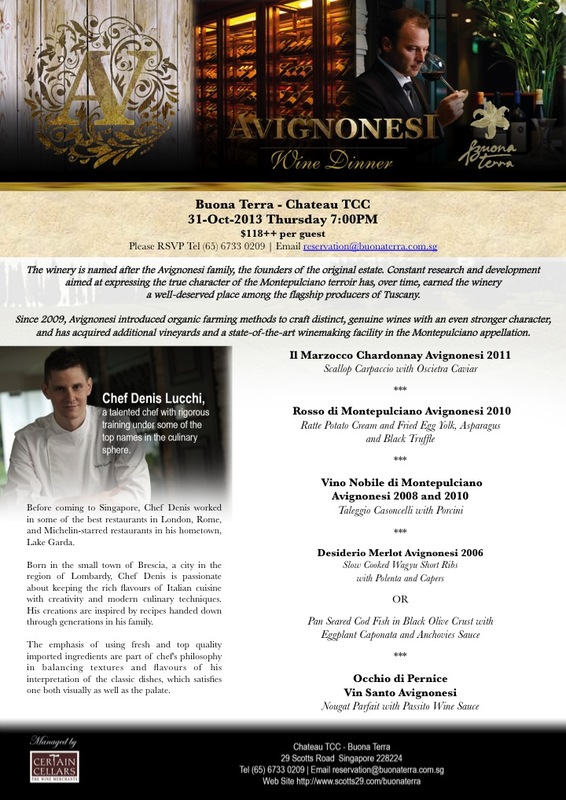 Come 31st of October 2013, Certain Cellars alongside Chef Denis Lucchi from Buona Terra are organising a FIVE course pairing menu with the great wines from the family of Avignonesi. For only $118++ per guest, you’ll be in for a treat! Call or Email them for reservations now! If you think that the RWS Celebrity Chefs Dinner is all they’ve got, you’re wrong! For the month of October, winner of the prestigious Bocuse d’Or in 2009, and owner of the famous Brygga 11 restaurant in Norway, Chef Geir Skeie will head to Singapore from 9 to 12 October for the fourth series of ‘Cooking with Friends’ at Osia. A young legend in Europe for his take on Nordic cuisine, Skeie began his love for food when he was eight years old, after being inspired by Norwegian chef Bent Stiansen on TV. It was at that point when he knew he wanted to be amongst the best chefs in the world, and eventually ended up as the winner of the Bocuse d’Or. A perfectionist by nature, Skeie spent the majority of his career working with champion chefs -those that participated in famous competitions, and made their mark on a global level. His curiosity for food and taste was a key driver pushing him to achieve success. In line with Osia’s culinary philosophy, expect some of Chef Skeie’s signature dishes such as the dill and lemon flavoured Norwegian ocean trout paired with smoked egg cream and pickled vegetables, fennel and garlic grilled Australian lamb leg and belly as well as a baked Norwegian turbot. The Drinking Market is honoured to be invited for this event on the 9th of Oct 2013, make your reservations and meet us there! OKOK!! I know you’re already drooling! But these are just some of the dishes we had at Platters this afternoon! I’m now in the midst of writing them, give me some time!! hahaha! See you at Traders Hotel Singapore!